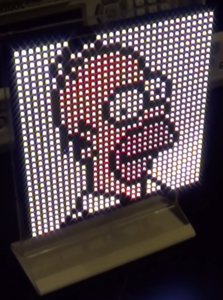 In this episode Shahriar and Timo demonstrate the design methodology of an FPGA based 32×32 RGB LED matrix driver. Timo has kindly devoted some of his time to describe the block diagram and the thought process which goes into designing this type of FPGA display driver. The various components of the overall system (PLL, UART, and Display Controller) are shown along with the simulation data. The outputs of the Spartan-6 FPGA board are then measured using a Keysight S-Series oscilloscope. The design of the RGB matrix is also demonstrated using a custom clock interface sent wirelessly to the unit via Bluetooth. All the FPGA design files can be downloaded here. Good project, you control with the bluetooth? I have to work out a game in an equal matrix with Xilinx, can you help me? 1)this project can show any pictures and photo u send via bluetooth?ur cellphone blotooth or another device? 2)what is that animation vhdl code?that’s just for this pic u drive to the dotmatrix in video?or it is totally for all photos? so, still no source code? Great great video very good job but please can you upload the source code so we can try this at home as soon as possible or maybe use it as a reference to my project thank you very much. Reply if you really reading this. Another great video, thanks a lot. Please upload the FPGA code. Thank you both … good videos as usual. You didn’t discuss the gamma correction in the display. Is there any reason it needed to be done in hardware, as opposed to letting the PC do it? I can understand the need for the hardware if the PWM was more than 8 bits. In your case you’re going from 8-bit command to 8-bit PWM. Just wondering if there is another reason I’m overlooking. Great project. Your videos are very educational. Thank you for doing them. Where do you post the source code? No Sourcecode 🙁 Do you even read the comments here? Yes, I will post it. Could you please upload the VHDL sources for the FPGA? Which FPGA-Board are you using? I really enjoy your videos and the information you are sharing so generously with the technical community.